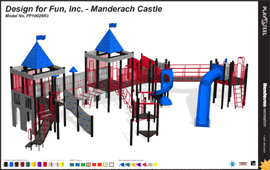 For its innovative design, unsurpassed quality, and incredible value, Henderson Recreation's PLAYSTEEL line of steel playground equipment is the product of choice for hundreds of schools, municipalities, child care centers and private enterprises. More importantly, PLAYSTEEL is the choice of children. Exciting components and limitless versatility make PLAYSTEEL the perfect play environment for children of all ages and abilities, developing both body and mind through challenging play. For every product they build, Henderson Recreation has made a priority of putting safety in the forefront. 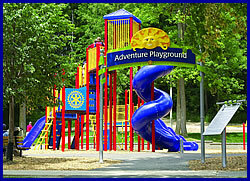 As a result, their PLAYSTEEL product line meets and in many cases exceeds the current standards for public playground safety, including the American Society for Testing and Materials (ASTM) F1487-05, the Consumer Product Safety Commission (CPSC), and Americans with Disabilities Act (ADA) accessibility standards. steel tubes and posts. This protective process prevents corrosion with its unique triple coating process. The tops of all posts are covered with an attractive and virtually indestructible aluminum cap. All tubes and posts are painted with non-toxic, lead and cadmium-free powder-coat paint, making it one of the best coatings in the industry. All platforms are constructed from heavy-duty expanded metal and hot-dipped in Plastisol. This process provides a play surface with traction and durability. 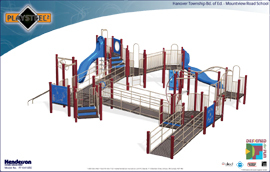 Using only the finest materials available, Henderson Recreation's PLAYSTEEL line of play equipment is sure to please both children and adults alike with its durability and attractiveness. With Henderson Bolt-N-Go, PLAYSTEEL components bolt directly to the post. This tidy, maintenance-free connection stays in place, makes installation simple, and keeps play areas wide open and free of protrusions. Bolt-N-Go uprights take the guesswork out of installation. The uprights are delivered to the job site pre-numbered, pre-drilled with threaded inserts and ready to receive play components. No on-site measuring is required, which eliminates the chance of installation error. With the installation process being this easy, your installed PLAYSTEEL playstructure will be just as compliant as your drawings. That's why Henderson is favored by installation crews and community-built projects everywhere. 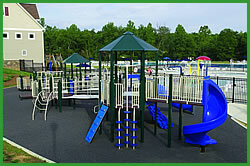 Additional Henderson recreation playground products include Playsteel2, Playsteel Max and Playsteel Fit. Free color renderings and 24" x 36" color posters available for all PLAYSTEEL designs. 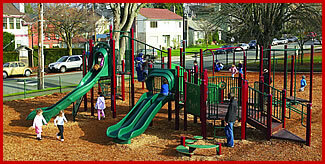 Check out the Henderson Recreation website at www.hendersonplay.com for more detailed information on the wide variety of high quality playground equipment products manufactured by Henderson Recreation Equipment Limited.